The Slovenian government has taken new measures to increase border security as an estimated 20,000 migrants attempt to break out of the Balkans into Central Europe. 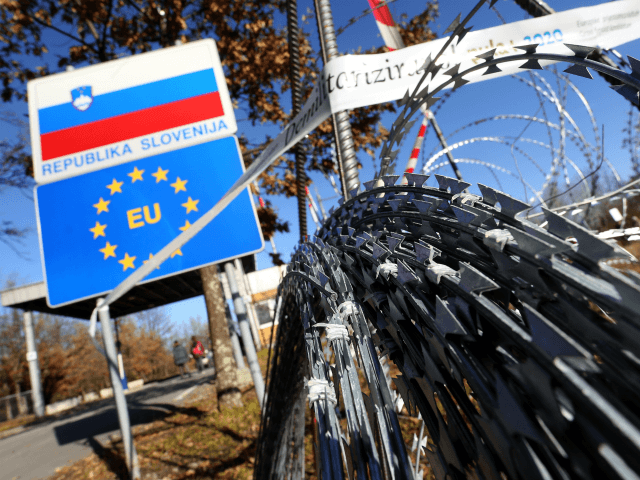 The Slovenian government has further fortified their border with Croatia, issuing police officers with firearms to control the flow of migrants trying to get through both Croatia and then Slovenia to western Europe, Il Giornale reports. The Slovenian operations on the Croatian border have not been without controversy, especially after Slovenian media filmed police forcing migrants, including some women and children, back into Croatia at gunpoint. The action comes as part of a joint cooperation between the two countries which has seen 635 missions featuring mixed forces from the two countries, half of which occurred on Slovenian territory and a half in Croatia, though exact numbers of migrants that have been caught in the patrols are unknown. For several months, the number of migrants in the Balkans has grown with some fearing that a large number will attempt to break through the border of Bosnia into Croatia, something that occurred in June when 200 or so migrants, some shouting “Allah hu Akbar,” stormed the border. “The majority come from Pakistan but there are also many Iranians, Algerians and Moroccans,” the source added. While the majority of migrant traffic at the height of the migrant crisis in 2015 came along the Balkan route, the path to Europe for the majority of migrants since has been across the Mediterranean following the closure of the Balkan route. Over the past year, there have been several signs showing increased activity in the Balkans but also in Greece where new routes from Turkey have formed.